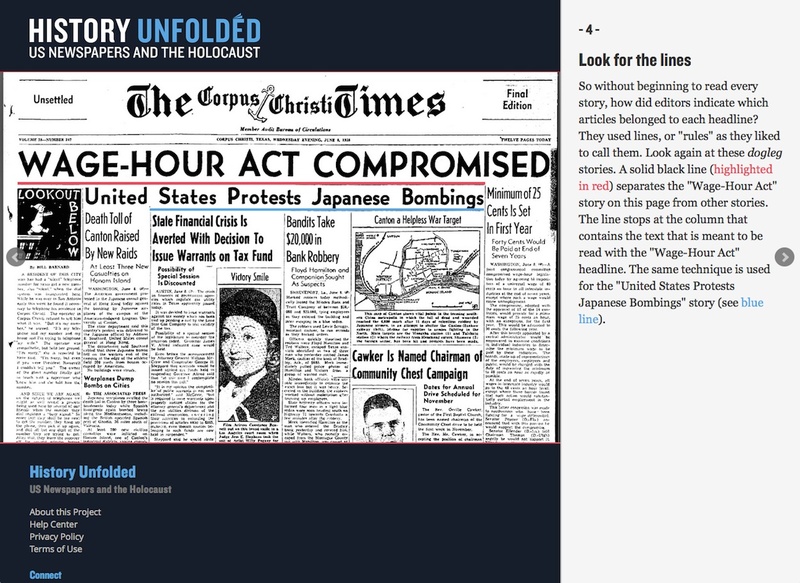 Here’s the homepage for History Unfolded, user-tested and updating from the back-end database. This is a listing of all 20 events currently available for research. 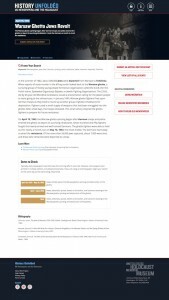 This is one expanded event module, with additional information on the importance and context of the event. We discovered many high school students don’t know how to interpret an old newspaper. So we taught them how. One stage of the five-stage article submission process, with a help module expanded. After review, approved articles go into a database, accessible to the public. Here is one article in the database. Every user has a profile page, tailored to their submissions and preferences. The goal for the project is for participants to explore Holocaust history as both an American story and a local story, to learn how to use primary sources in historical research, and to challenge assumptions about American knowledge of and responses to the Holocaust. The collected data will show trends in American reporting. It will inform the Museum’s upcoming exhibition on Americans and the Holocaust, and enhance scholarly research about the American press and the Holocaust. The events. 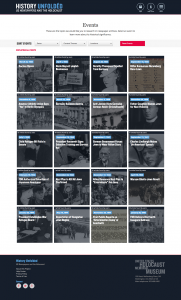 With the help of the curator of the upcoming exhibition, the History Unfolded team has selected 20 pivotal Holocaust-era events in the United States and Europe for users to research. 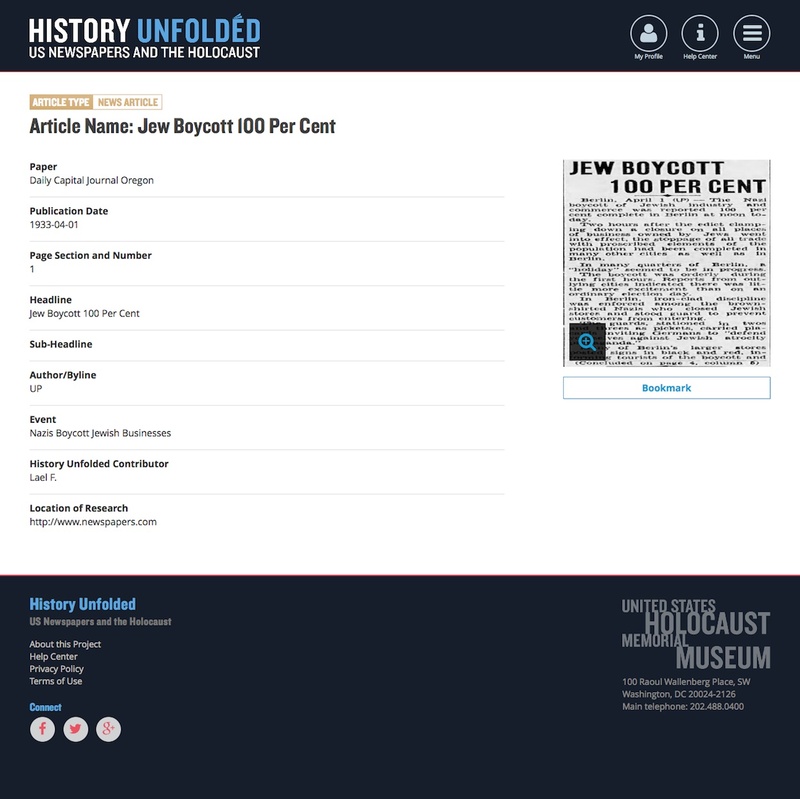 Each event is accompanied by a module, which includes keywords and key dates to guide research in newspapers, as well as a brief description as to why the event is important in history. The research. After browsing events, participants are invited to submit articles from their local papers, as they find them in online databases, microfilm, or archival collections. 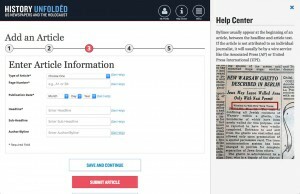 The site includes tips on using a microfilm reader, reading an old newspaper, and finding newspaper collections. The submissions. 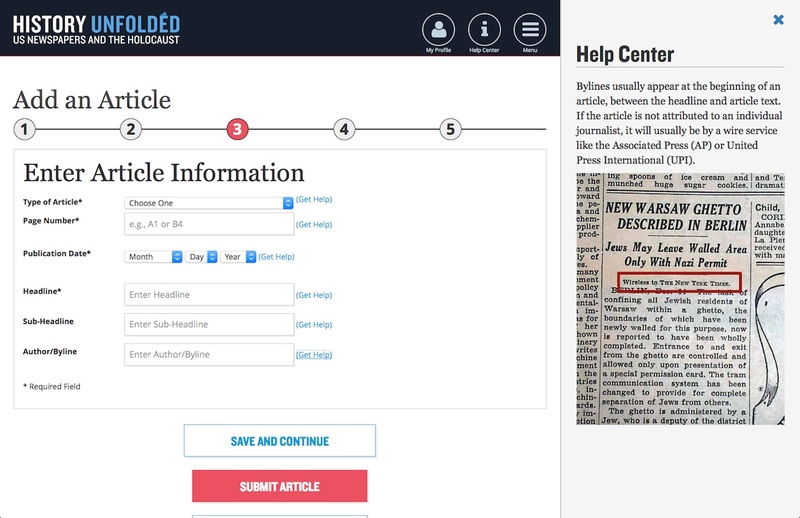 Once a participant has found a newspaper article, a five-step submission process follows: the participant selects the event to which the article corresponds, she selects the newspaper and archive where she found the article, she enters data (headline, byline, page number, type of article, etc.) about the article, she uploads a thumbnail image of the article in the paper, and she reviews her work and adds comments about her research. The submitted articles are sent to a community manager for review. The articles. 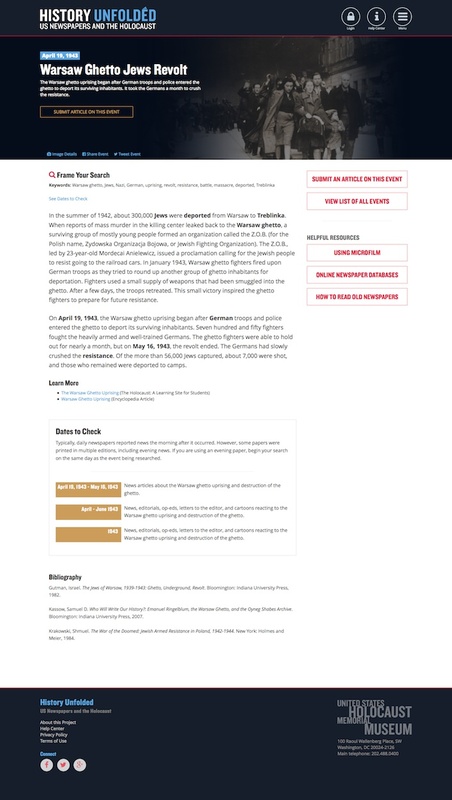 Under the hamburger menu is an item titled “Search Database.” This allows site visitors to search the entire database of published articles across any dimension of data, or to view the entire database of more than 600 articles (as of March 7, 2016). Additionally, a map on the homepage allows visitors to see which states have the most and fewest articles submitted from their newspapers, drawing upon this total data set. The profile. Each user has a profile page, which lists their submitted articles and each article’s review status, any searches or articles from the database they might have saved, links to FAQs, the number of their submitted articles that have been published, and the total number of published submissions for the site. The United States Holocaust Memorial Museum defines “Citizen History” as the practice of non-historians using the historical method to help an institution answer a real historical question in a cooperative and collaborative way. Citizen history presumes that the best way to understand history and historical practice is to participate in authentic research. In citizen history projects, everyone benefits – the institution or historian gains the support of many hands and perspectives in performing the research, while members of the public learn about the history, gain new skills, and get to be part of a larger social good. All participants in a citizen history project also hold responsibilities. The institution or historian must take the contributions made by the public seriously – those contributions must truly be part of the research. The institution must scaffold the learning experience for the public and be available to answer questions, provide suggestions, and resolve problems. The public must make their contributions in good faith and to the best of their ability. Citizen history is based on the well-established concept of “Citizen Science” — where scientists enlist the public to assist with real scientific research and questions. 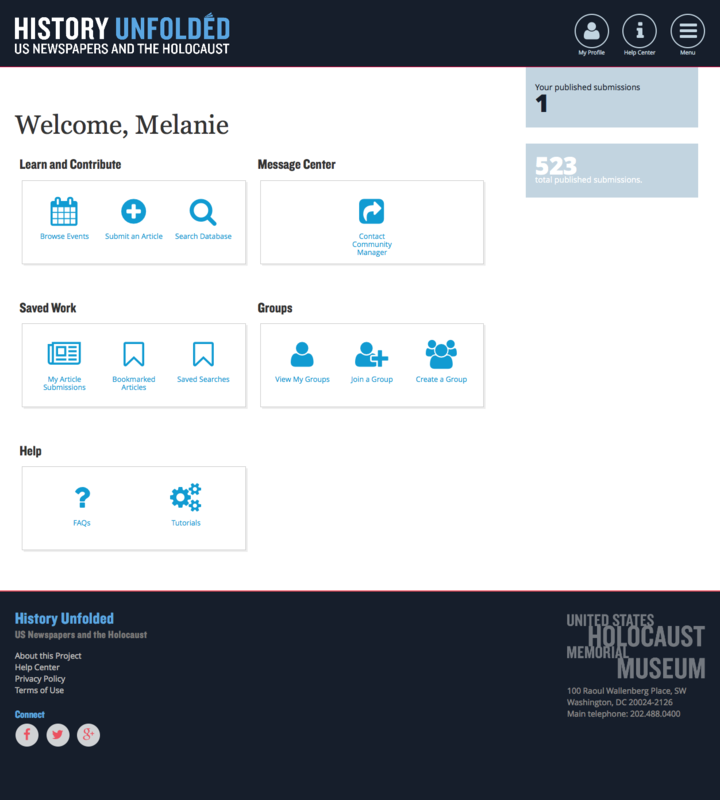 Building on the lessons learned from citizen science, the USHMM developed its ideas for citizen history through careful research, prototyping, and testing. 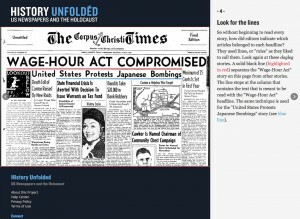 History Unfolded represents years of work to create a full citizen history experience for the public. Together, the Museum and the public can create a lasting contribution to our understanding of Holocaust history. 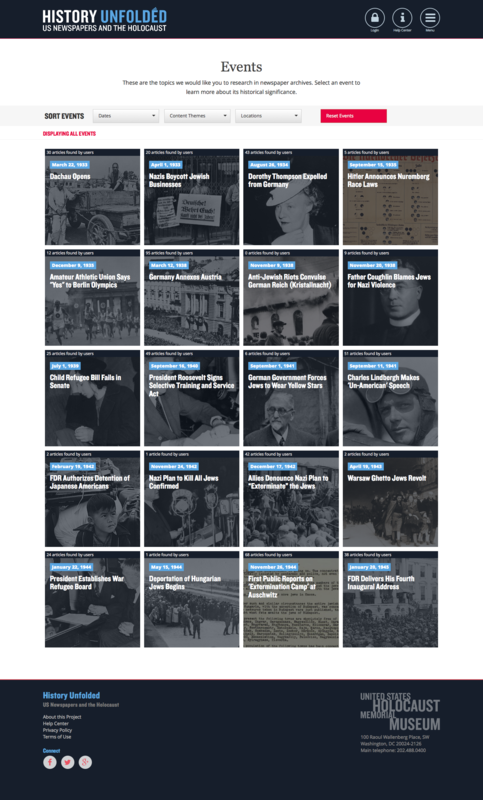 In addition to this work supporting an upcoming exhibition at the USHMM, scholars more broadly have not performed extensive research on 1930s and 1940s US papers beyond the New York Times. 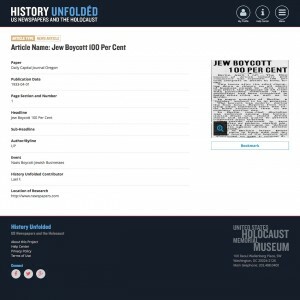 Research conducted in local newspapers and added to the History Unfolded database actively extends the possibilities for scholarship on what Americans broadly, and local communities more specifically, knew about the Holocaust and when.